Flashers and Solid State Flasher Products by DARE Electronics, Inc.
DARE Electronics designs and manufactures flashers to MIL-F-26301 and other flashers with solid-state or electro-mechanical outputs. Used on military, airborne, or ground support applications, DARE flashers and recycle timers can periodically turn on and off navigation, position, warning or indicating light or sense and indicate a malfunction in certain systems and activate an alarm. 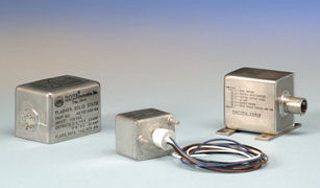 Available in a wide variety of finishes, enclosures, connectors, and mounting arrangement, DARE flashers and recycle timers can be powered from sensing input lines or from separate AC or DC supply and supplied in inductive & lamp load models. In addition, DARE can supply flashers and recycle timers that can be used as direct replacements for thermal or motor driven timers. Numerous customers, including Lockheed, Boeing and the Department of Defense (DoD) have recognized DARE Electronics for its outstanding commitment to quality & delivery.